Homemade Bagel Recipe | Get In The Kitchen | Cooking. While. Awesome. 375 grams unbleached flour this is about 3 cups, but best to measure with a scale. Put dry yeast into hot water with a pinch of sugar and leave until it forms min 1" of foam. Mix flour with salt, malt flour, 1/2 tsp sugar and olive oil into the mixer and add the yeast solution. Mix well and then split into 8 equal portions and form a ball with each. Cover and refrigerate for about 18-24 hours and then let sit on the countertop for 2-3 hours to rise further before using. Add any fillings like dried onion, garlic, sesame seeds, etc. to your bagel dough and incorporate it into the dough by kneading the dough. Form it back into a ball and smooth out the dough as best you can. the smoother the dough, the smoother the bagel. Once in a ball, use your thumb to poke a hole and make it a pronounced hole. 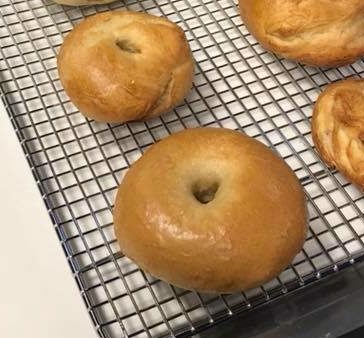 Place bagel into boiling water for 2 minutes. Take out and top with any toppings and then place on a greased baking sheet. Let cool for 10 minutes before using and slicing.